HHV’s magnetron sputtering system has been engineered for the mass production of electronic components such as electrical contacts, connectors, relays, thick film resistors, reed switches and sensors. The system has been design to deposit rare materials like Platinum (Pt), Palladium (Pd), Rhodium (Rh), Gold (Au) and Silver (Ag) to produce highly efficient, uniform thin films for even the most complex applications. 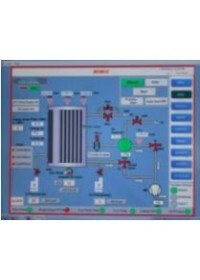 Comprehensive SCADA-based vacuum and process control automation provides repeatable run-to-run operation. Process recipe selection is provided and the system can send out SMS messages in the event of needing attention. A cryo-based pumping system enables an ultimate vacuum of < 5x 10-7 mbar in the chamber. 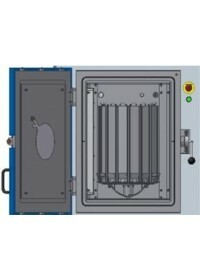 The sputtering tool is fitted with a cylindrical process chamber of 500mm diameter x 700mm height. The cylindrical drum-type substrate holder can accommodate up to several thousand substrates, depending on size. The cylinder is fitted vertically and is driven by a DC drive mechanism with variable rotation speed from 1 to 20 rpm which enables uniform deposition of materials on the substrates. An HHV water-isolated magnetron sputter source is fitted. The sputter target has dimensions of 145 mm x 550 mm and the source is designed for target utilization of greater than 60%. The source is optimally positioned for uniform deposition of material onto the rotating substrate holder. 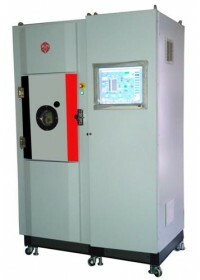 The source can be powered with 10 kW DC or Pulsed DC to suit the target and the required quality of the deposited films. A mass flow control system is integrated to provide the required process gases.